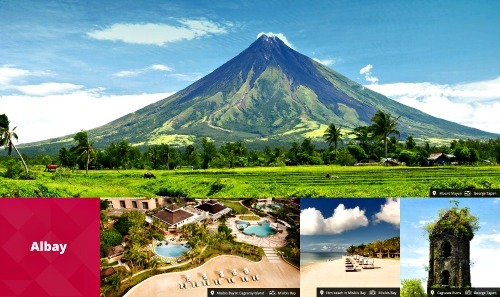 Albay’s tourism now literally sizzles and continues to further heat up. Records of the Department of Tourism (DOT) and Albay Provincial Tourism and Cultural Office (PTCAO) show that from a modest 8,700 tourist arrivals in 2006, the figure pole-vaulted to 383,000 in 2013. Of the number, about 300,000 came in only within three years beginning in 2010. Following this phenomenal performance, Albay was presented as the Philippine’s most favored destination during a product positioning and promotion campaign by a DOT marketing team led by Tourism Secretary Ramon Jimenez at the Hyatt Hotel in Hong Kong on June 23. Earlier, six of Hong Kong’s well respected newspapers, led by the South China Morning Post and the Hong Kong Standard, featured Albay’s tourism wonders, foremost of them Mayon Volcano. Governor Joey Salceda said other areas that are just as vulnerable to climate change, can learn a lesson from Albay: that they too, can emerge from being disaster-afflicted to a dynamic LGUs. Salceda had employed a multi-pronged development approach that combines Disaster Risk Reduction-Climate Change Adaptation (DRR-CCA); Nature, Culture, and Events Management, Product Positioning, Facilities Improvement, and Active Promotions. He said Albay’s DRR-CCA icon has become a platform for the projection of a green image for the province. In fact, Albay’s CCA-DRRM Training Institute at the Bicol University here, has become a major tourism magnet for foreign and local tourists, having trained officials from seven countries, the country’s regions, 27 provinces, 24 cities, several hundreds of towns and almost a thousand barangays. Under its program to protect nature, Albay has increased its forest cover by 88% which regenerated aquifers which now feed water to rivers and waterfalls despite the drought; expanded its mangrove forests by 1,700 hectares in 4 years; launched its No-Plastic-Bags campaign; passed an Anti-Smoking ordinance and instituted a Mining ban. On events management, Albay has strived to become a favorite convention venue and won hosting of UNWTO-ASEAN conferences, the 2015 APEC meetings, and the Meeting of the Green Climate Fund Board in 2015. It has likewise worked out partnerships with Legazpi City and other LGUs on conventions and conferences. On product positioning, Albay has positioned itself as the gateway to Bicol through the Bicol International Airport; developed seaports like the Port of Pioduran where 356,000 passengers coming from Masbate, Cebu and Panay used the RORO in 2013; institutionalized the ALMASOR Tourism Alliance which now cross-markets the natural unity of Albay, Masbate and Sorsogon as demonstrated by the Butanding of Sorsogon, Mayon ATV of Albay and Rodeo of Masbate; promoted the Colors of Albay tourism circuit organised into 4 products – (a) ecotourism (green); (b) colonial heritage (gold); (c) crafts (brown); and (d) seas and islands (blue). On facilities improvement, Albay has upgraded the Almasor roads, Guicadale roads (roads leading to international airport), Albay West Coast road, Cagraray Circumferential Road and Sula Bridge, Ligao-Pioduran Road and the Libon-Pantao Road.